This summer, I contributed to the Guggenheim’s Museum The Take, a blog launched in conjunction to the online and multi-sited venue exhibition YouTube Play. A Biennial of Creative Video (October 22-24, 2010). The exhibition’s related blog featured entries by guest writers considered experts in film, video, and Internet culture. My contribution, “The New Video-Maker: Art Museums,” focused on video content produced by art institutions. 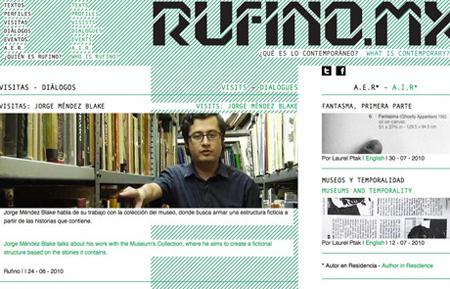 Image: Museo Tamayo’s new online magazine www.rufino.mx, launched in the spring.